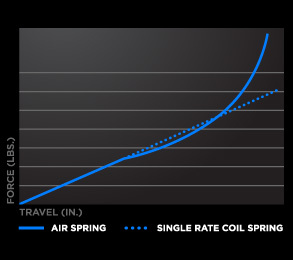 FLOAT stands for FOX Load Optimized Air Technology; our unique and patented FLOAT air springs offer the perfect adjustable spring rate synergy to our refined, oil damped performance. The spring rate is controlled by air pressure in the main body. 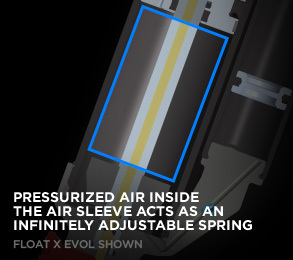 Air pressure is infinitely adjustable anywhere from 50 PSI to 300 PSI, making the FLOAT the most progressive and adjustable air shock on the market — zero tools are necessary to change plushness.